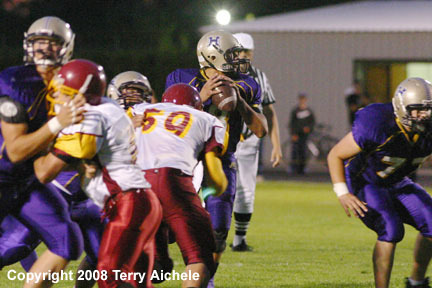 Hermiston quarterback Faafiula Ena drops back, sets up and lets fly with a pass during the Friday night game. 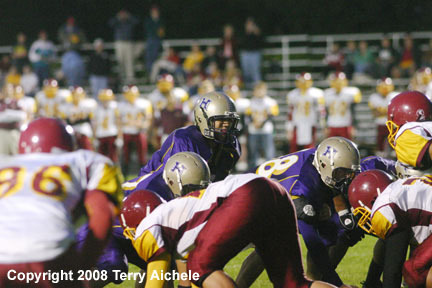 HERMISTON - The Hermiston Bulldogs hosted IMC competitors The Dalles-Wahtonka for the Friday night game. The Bulldogs, with the strong passing arm of Faafiula Ena, dominated the game for a 49-0 win. The Dawgs took the opening kick off and with a mix of passes and runs made it to fourth down on the TDW ten yard line. Hermiston sent Luis Ortiz in to attempt a field goal but TDW was flagged for offside which brought Hermiston to a fourth and five. 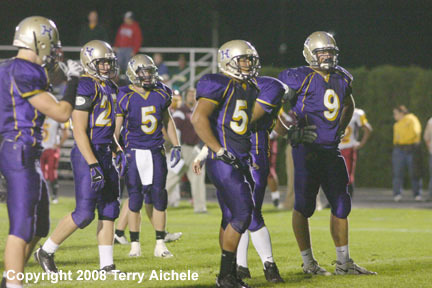 Hermiston lined up for another field goal attempt and once again TDW was offside bringing Hermiston a fourth and two. Hermiston decided to go for with Ena doing a little run to the side and handing off to Tyler Green who made it into the endzone for the first touchdown at 8:57 of the first quarter. Luis Ortiz hit the first of a perfect seven for seven PAT's for the game. TDW took the kickoff and couldn't get anything going so they ended up punting from their own 22 yard line. Hermiston ended up with the ball on their own 41 yardline with 6:49 to go in the first. Hermiston used mostly passes to make to the TDW ten yard line with 4:30 to go. Ena dropped back and threw to Cody Humphrey for a ten yard touchdown pass. Ortiz made the PAT to give Hermiston the 14-0 lead. Hermiston's defense held TDW deep in their own territory forcing the visitors to punt with about 1:52 to go in the first quarter. Hermiston was on the 49 yard line with a first and ten when Ena used a play action pass to throw to Johnny Kayembe who makes it to the TDW ten yard line. While being tackled Kayembe fumbles and TDW recovers. The Eagle Indians quarterback Nate Timmons went to Chucky Uilata, Ray Niko and Damian Telles and gained about four yards. TDW was forced to punt again. Hermiston took the punt to the TDW 40 yard line. Ena connected on a pass to Luis Ortiz that took the Dawgs to the TDW twenty yard line. Ena handed off on a counter which took the Dawgs to the TDW ten yard line. With a first and goal on the ten yard line, Ena dropped back and passed to Luis Ortiz for a touchdown. Ortiz followed up with another PAT to give Hermiston the 21-0 lead with 9:28 to go in the first half. The Eagle Indians tried to run and tried to pass and came up with a loss of twenty. So they forced to punt at 4th and 20. Hermiston takes the punt to the HHS 38 yard line. Acouple of incompleted passes and a short run forces Hermiston to punt on a 4th and 6 on the 44 yard line. Fortunately for Hermiston TDW was flagged for offiside. 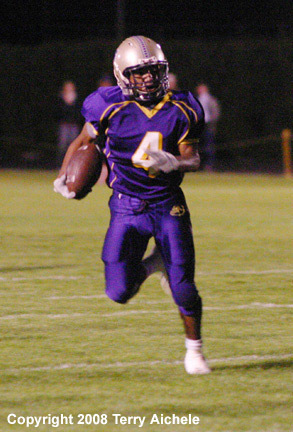 This gave Hermiston a 4th and 1 on the 49 yard line. Then TDW was offsides again giving the Dawgs a 1 and 10. Ena then took the snap and with play action moved to make a pass to Dorian Williams all the way to the TDW three yard line. 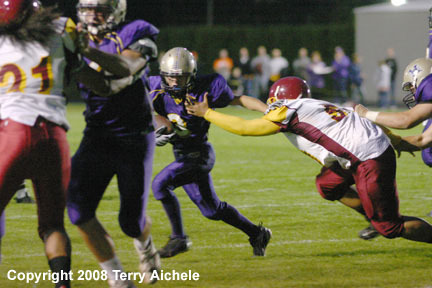 An illegal motion penalty action on the next play pushed Hermiston back to first and goal on the eight yard line. Ena then handed off to Green who took the ball to the TDW one yard line. On second and goal Ena made a quick pass to Green for a touchdown. With another Ortiz PAT the Dawgs had a 27-0 lead with 3:40 to go in the half. TDW was unable to make any progress following receiving the kickoff. They ended up with fourth and 14 on their own ten yard line. Stevie Martinez took the punt for Hermiston and ends up on the TDW 28 yard line. Another offsides by TDW gave Hermiston another five yard so they were on the TDW 23 yard line. Ena dropped back and let loose a throw to Anthony Montez for a touch down. The PAT was good giving Hermiston a 35-0 lead with 2:18 to go in the half. The Eagle Indians couldn't get anything going and gave the ball back to Hermiston with about 13 seconds to go. The half ended with Hermiston leading 35-0. The Dalles-Wahtonka took the second half kickoff and controlled the ball until Hermiston intercepted a pass at 9:42 of the third quarter. Ena threw a pass to Johnny Kayembe which set up the next play. Ena handed off to Tyler Green who ran about 60 yards for a touchdown. With the almost automatic PAT the Dawgs took a 42-0 lead. 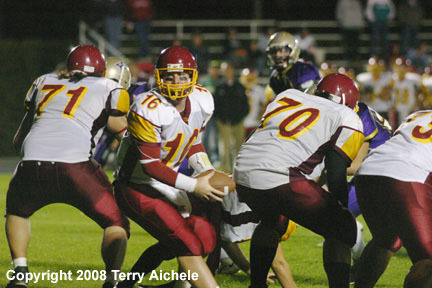 TDW wasn't able to get anything going so they punted to Hermiston. 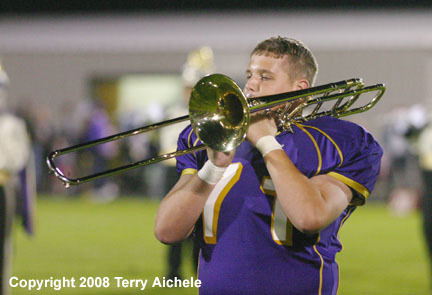 Hermiston moved down to the TDW 20 yard line on their next possesion. In a great play a TDW defender was able to intercept the Ena pass on their own six yard line. TDW wasn't able to get anything going and were once again forced to punt. With 3:12 to go Hermiston took the possesion of the out of bounds punt on the TDW 30 yard line. Ena completed a couple of passes with the final one to Tyler Green for the touchdown. Luis Ortiz hit the PAT giving Hermiston the 49-0 lead. That would end up being the final score. 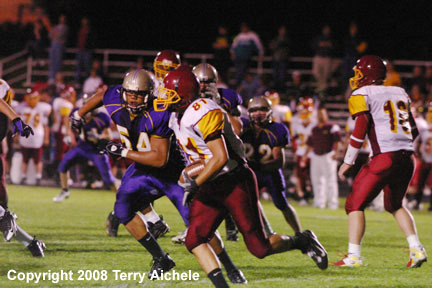 The Dalles-Wahtonka didn't get anything going no matter how many times they went to Chucky Uilata, Ray Niko and Damian Telles. Hermiston sophomore Mark Hodges took over most of the quarterback duties during the fourth quarter. Also getting a few calls in was sophomore Tim Rude. The Dawgs moved the ball well under the junior quarterback but they didn't score again before the end of the game. LEFT - Hermiston junior quarterback Faafiula Ena sets up to pass to his left early in the first half of the game Friday night. RIGHT - Hermiston's Faafiula Ena barks out signals early in the first half of the game with The Dalles-Wahtonka on Friday night. 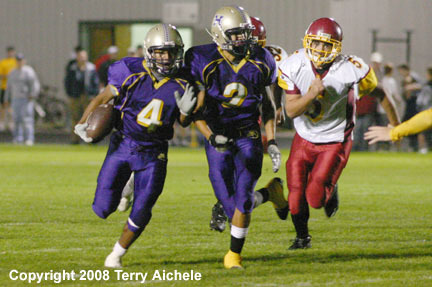 LEFT - Hermiston senior running back Tyler Green tries to find an opening during the game against TDW on Friday night. 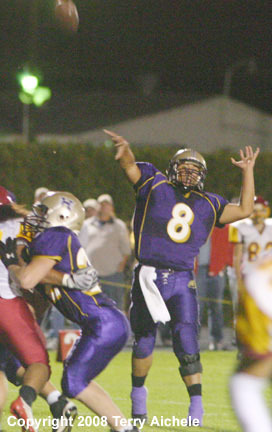 RIGHT - Hermiston's Luis Ortiz hits one of his seven for seven point afters in the Friday night game against TDW. LEFT - The Dalles-Wahtonka wide receiver Damian Telles was used quite a bit on end around plays during the game on Friday night. RIGHT - Bulldog sophomore Stevie Martinez carries the ball, backing him up is Luis Ortiz. 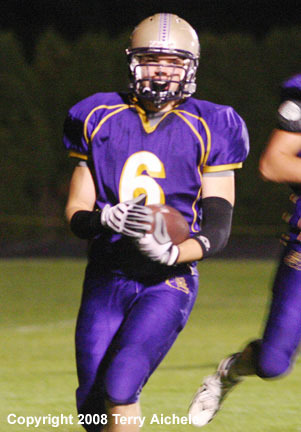 LEFT - Hermiston's Stevie Martinez breaks into the open on a run during the game on Friday night. RIGHT - The Dalles-Wahtonka quarterback Nate Timmons moves to his left on would end up being a quarterback keeper for a short gain. 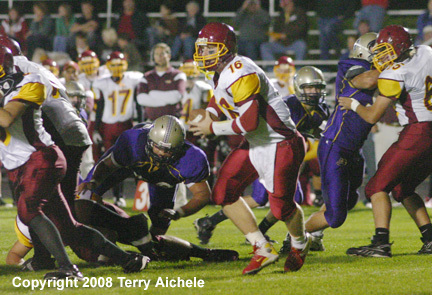 LEFT - The Bulldog defense kept TDW stuck in their own end of the field for most of the game Friday night. 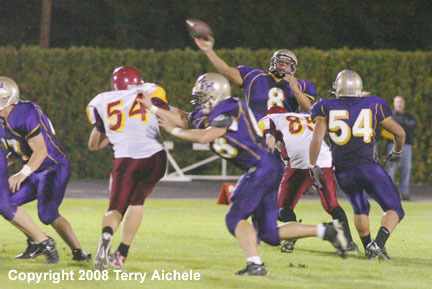 RIGHT - Hermiston quarterback Faafiula Ena let's fly with a pass deep in TDW territory in the second quarter. LEFT - Faafiula Ena throws another pass near the TDW endzone in the first half on Friday. RIGHT - Hermiston's Adam VonArx smiles just moments after catching a touchdown pass in the first half of the game on Friday.